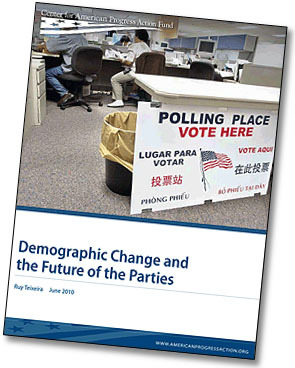 Back in 2002, John Judis and Ruy Teixeira wrote The Emerging Democratic Majority, which argued that demographic trends over the next several decades were set to heavily favor the Democratic Party. Unfortunately, 2002 turned out not to be a great year to make a prediction like that: Republicans gained congressional seats in the midterm elections that year, and two years later George Bush won a second term in the White House in an election that saw Republicans make even further gains in Congress. But those gains were almost certainly heavily influenced by the increased salience of national security issues following 9/11, and in any case weren’t quite as impressive as they seemed at first glance. Bush’s reelection, in particular, was a razor thin affair, not the easy victory you’d normally expect for an incumbent running during good economic times. Sure enough, two years later Democrats won back Congress, and then in 2008 took back the presidency and won landslide victories in both the House and Senate. about as he predicted. Minorities have increased their share of the vote by 11 percentage points since 1988 and have become even more strongly pro-Democratic than they were eight years ago. Ditto for white college graduates, professionals, women, and the religiously unaffiliated (the fastest growing “religious” group in the country, he reports). This was  the first year the 18- to 29-year-old age group was drawn exclusively from the Millennial generation, and they gave Obama a whopping 34-point margin, 66 percent to 32 percent….Obama got 60 percent of the youth vote or more in every swing state in the 2008 election with the lone exception of Missouri. ….The 2008 election also saw 18- to 29-year-olds increase their share of voters from 17 percent in 2004 to 18 percent….This figure will steadily rise as more Millennials enter the voting pool….The number of Millennials of voting age will increase by about 4.5 million a year between now and 2018. And in 2020 — the first presidential election in which all Millennials will have reached voting age — this generation will be 103 million strong, of which about 90 million will be eligible voters. Those 90 million Millennial eligible voters will represent just under 40 percent of America’s eligible voters. Research suggests that a socialization process occurs that leads young adults to hold onto the party identification and opinions that they developed in their formative years. This is especially true with partisan identification. Party identification is the single strongest predictor of how people vote and tends to stick with individuals once they form an attachment early in their political lives. Even if the Republican Party eventually softens its views on social issues, it won’t make much difference once the Millennials have reached age 30 and their party identification has hardened. If Teixeira is right, by the time this process is over an entire cohort of voters will be heavily pro-Democratic for the rest of their lives. As it happens, 2010, like 2002, might not be such a great year to make this prediction: a brutal recession and the usual midterm blues are likely to produce big Republican gains this November. In the long term, though, the longer the Republican Party continues to rely on its intolerant, ultraconservative base for support, the more likely they are to write their own obituary for 2020 and beyond.